Cauliflower is one of the cruciferous vegetables which is packed with antioxidants and fiber. However, it may not be your kid's favorite at first. Blending the cauliflower with the mashed potatoes so the taste and texture is more familiar is a winning strategy to get your family loving cauliflower. I don’t peel my potatoes because there is a lot of nutrition in the skin. Tonight I used a yellow organic potatoes. If your tasters are not used to skins in their mashed potatoes start by peeling most of them and leaving a few skins. Gradually, this dish can be made with more skins and with more cauliflower. This is a basic recipe which can be used as a jumping off point. You can use frozen cauliflower as well. One of my Tasters, Maria told me that she hates cauliflower. When she tasted this dish I didn’t tell her that it was in the potatoes. To my surprise, she gave it a “Super Yum!” I told her congratulations, she now LOVES cauliflower!! This is a great way to reduce carbohydrates if you have family members trying to lose or maintain a healthy weight. 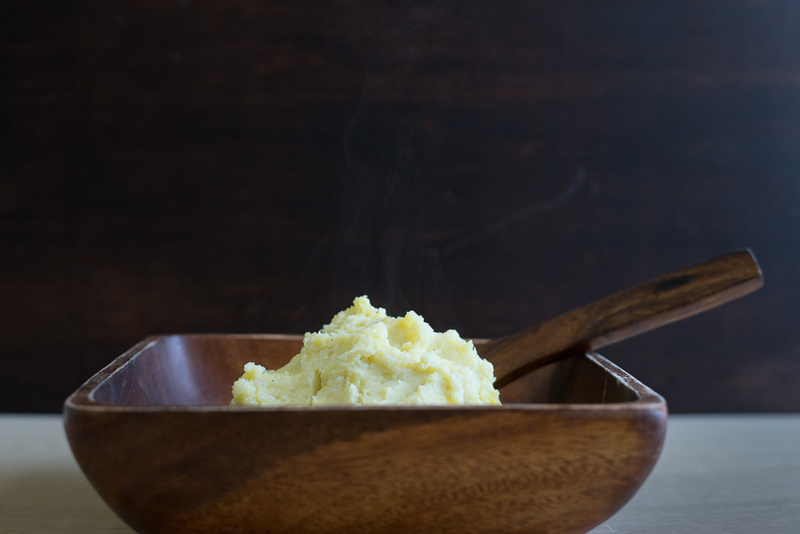 By adding in cauliflower the mashed potatoes are reduced in calories and carbohydrates dramatically. Bring potato chunks to a boil in a medium pot. Bring heat down to low and simmer for about 20 minutes until fork tender. Meanwhile steam cauliflower in a steamer basket and steam until tender. Alternatively put cauliflower in a medium bowl with about one inch of water, cover bowl and microwave on high for 4-6 minutes until very soft. Drain most of the water and blend cauliflower in food processor or blender until smooth. When potatoes are cooked, mash with skins on, adding blended cauliflower, butter, milk and garlic salt and pepper to taste. Serve hot. This is also a great recipe for babies new to eating. Before you use salt, set aside a portion for baby. Make sure you mash very well if they are brand new to solids and leave some texture as they become more experienced.